Chris and Sonja - The Sweet Seattle Life: Co-Housing Community. Yea or nay? 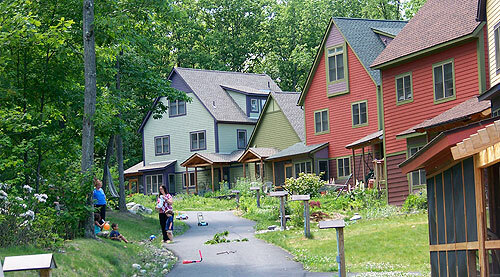 Co-Housing Community. Yea or nay? The Millennial Housing Trend is a Repeat of the Middle Ages. But I'll admit: I'm kind of intrigued by the idea of co-housing. An important caveat: I am not attracted to the type where everyone shares kitchens and bathrooms. That's too much sharing. But I have this picture of single-family townhomes with large shared outdoor areas, and a big rec room that hosts community BBQs and Saturday Movie Night. I imagine a band of kids roving around, playing in the pool, walking over to their friends' houses, and then all gathering to catch the bus on Monday morning. This one looks especially lovely. What do you think? Heaven or hell? Photo (at left): Broad Street Commons (has a pool!!!). 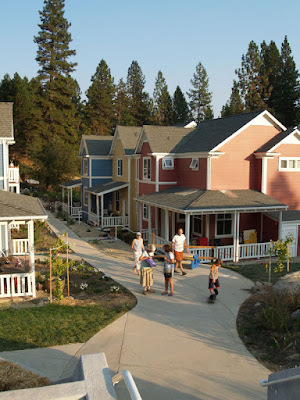 I always wanted to live in exactly the type of co-housing you are describing. Shared laundry rooms also make sense. I settled for a shared dock, and still think it terrific, despite the occasional headaches of neighbors who aren't exactly the co-housing types.